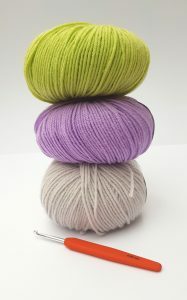 Today I realised that it is a year to date since I started teaching crochet. Where has that year gone?! Who am I to teach crochet? I am self taught. What gives me the right to teach others? Can I actually teach people to crochet? What happens if I can’t explain the techniques properly? Is there anyone out there who would actually like to learn? Do people still perceive it as a granny skill? To test the waters, I put a couple of posts on some local community pages. The response was overwhelming with over 100 replies of interest for each post. I absolutely knew that not all of those would transfer into students but the demand certainly seemed to be there, so I went for it, despite the above anxieties! Over the last 12 months, I have run 85 lessons, totally 9960 minutes of crochet teaching. During this time I have taught over 110 students in 7 different locations, (with a large selection of different motivational snacks!). When I actually stop to look at these stats, I am actually pretty amazed and proud of what I have achieved. Most of my amazing students have never picked up a crochet hook before and have all come away being official crocheters! 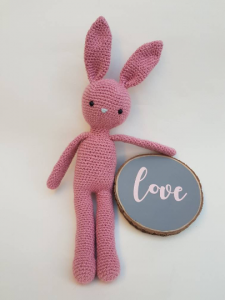 For the couple that have come to me already knowing how to crochet, they have picked up additional skills and tips to increase their repertoire. It has, and continues to be a learning for me too over the last 12 months. I have tweaked the format, days and locations. I have reluctantly realised that trying to run too many lessons, alongside working the day job is not manageable, and whilst the dream is to increase these and lessen the day job (shhh, don’t tell the day job), at the moment this is not realistic and I cannot do it all. 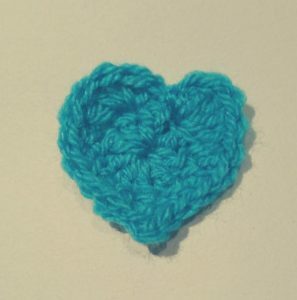 The one thing that I am most proud of is the amazing little crochet community that has emerged from the lessons. 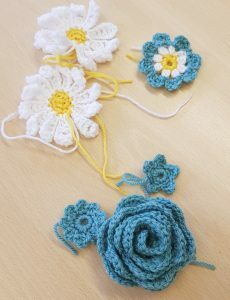 Each of the sessions in the different areas has its own personality and it is so lovely to see each group coming together, friendships forming and people supporting each other, not only with any day to day frustrations or issues but with crochet projects and techniques. 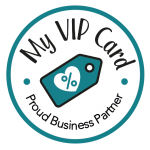 I have many regulars who come each fortnight, not only to build on their skills but to use it as their social and their little space to relax and chill from their busy lives. It is so lovely for me to sit and observe not only friendships developing but also crochet confidence increasing. 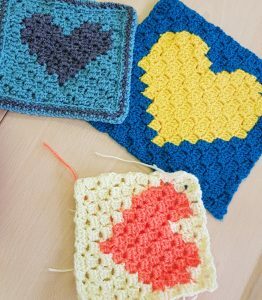 Some of my ladies are teaching others how to crochet, some are starting to alter patterns to their own preference. I have even converted a few knitters from the dark side (there is a swear box for the dark side discussions!). 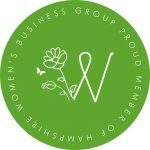 I would like to say a huge thank you to all my wonderful ladies (they are all ladies but men are more than welcome to join us too!). Thank you for your faith in my skills and for your commitment and thank you for your support for me personally and my little crochet corner. I can’t wait to see how the next 12 month develop and see the lessons go from strength to strength and support even more people in finding their crojo! Aptly it is Word Mental Health Day today, on the day I decided to tell my story about how I came to become a crochet addict. 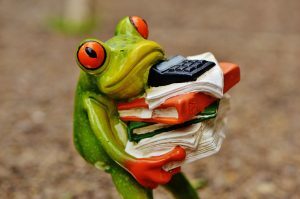 I have a fairly stressful day job, lots of difficult challenges and problems to solve, which if I don’t get right, could have serious consequences for my employer. I took up my current position around 8 years ago. For a long time, with no confidence in my own abilities, I felt I had to work 24/7 to prove myself worthy of the title. I worked all hours and was often known to ping emails off late at night and weekends (even on holidays). It took me a good few years (about 3 years ago) to realise that this wasn’t helpful for me or the organisation. I was never able to switch off, always thinking and worrying about work and it was having an impact on my family life. Also, what sort of message was I sending to colleagues by sending emails late at night. Was I rising their expectations that I would deal with things immediately, or was I adding unknown pressure on them to respond to me? This is when I taught myself to crochet (thank you Lucy from Attic 24!). I could knit (just about but badly) but I wanted to learn to crochet when someone asked me to make a knitted character from the Harry Hill programme and it turned out the pattern is actually crochet (who knew!). I also was fascinated how you could create toys from just this little hook? Crocheting really helped me put work to one side when I was at home and actually relax. I couldn’t wait to sit down with my hook and yarn and lose myself in whatever I was creating at the time. I still can’t and secretly resent those ‘I could be crocheting moments!’. Since that time, I have opened my own crochet business, designed my own patterns and now teach and pass on the fantastic skills of crochet so others can discover the benefits. It is quite amazing how many people come through my crochet doors with similar stories to me of burn out, stress and wanting to find something to help. 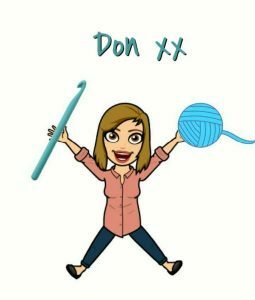 I will talk more about the recent studies that have been conducted into recognised benefits of crochet and the impact it has not only on mental but also physical health, in another post. I will whisper this however – sometimes my crocheting can be the actual source of my stress but that is a story for another day (shh, don’t tell my hooks!). Thanks for getting this far. I would love to know what you do to look after yourself and to help yourself relax and switch off.